It’s a truism that guidebooks should always be written by experts on the subject. This book fulfills that truism quite well. Lafayllve has been lecturing and performing rituals for the heathen faith since 1996, which will make next year her twentieth anniversary of doing so. She has held almost every position of authority possible within The Troth, one of the longest-standing Asatru organizations in the world, and the depth and breadth of her knowledge on the subject, both personal and academic, shines through in this book. The book is organized in an eminently practical manner, as befitting the title. The first section begins with the basics — an introduction to heathenry, followed by history, deities, ancestor worship, wights, costmology, concepts such as wyrd, orlog, and time, and then moving on to more advanced information, such as innangardh/utangardh, runes and magic, seidh, ethics, hospitality, and oaths. The second part of the book deals with rituals and blots — their purpose, their forms, and the reasons for them. As important as the organization is the style in which the book is written. Lafayllve’s voice is clear, confident, and no-nonsense while still possessing a distinct lilt of poetry to it. More important than style or organization, however, is the book’s content, and here is where Lafayllve’s knowledge truly shines through. Whether writing about the most basic of concepts, or explaining more complex ones, or detailing the steps taken in the most advanced of rituals, the author has no difficulty in clearly sharing that information, whether the reader is brand-new to Asatru or has been with the faith for years. An excellent example of the latter is the sample wedding ceremony, found on page 211, where the author walks the reader through each step of the ceremony. Nor does this section leave out the need to contemplate what follows in the unfortunate event that the marriage doesn’t work out, as the section that immediately follows deals with divorce, and potential ways to deal with the oaths that were taken as part of the marriage. The section on rituals — both blots and sumbls — covers the gamut, involving not just seasonal or deity-specific rituals, but rituals that are involved in all the major life events that people go through: the births and naming of children, adulthood rituals, and funerals. The author provides sample rituals for each of these, and gives enough information for the sample deity-specific rituals that the reader should be able to adapt these to any deities who are not included in the book. For example, there are blots to Frigga, Sunna, and Odin (the latter two as types of Yule rituals), but none for Thor, or Freya, or Tyr. The final section of the book (aside from the glossary, bibliography, and index) is an appendix dealing with the oft-argued diversity of thought among heathens on Loki. Lafayllve does an excellent job here of dealing with both sides of an issue that has caused a great deal of strife between heathens of both sides (those who want nothing to do with Loki, and those who honor him). She encapsulates what the lore says about him, and both the positive and negative sides of his acts, and finishes up by stressing the etiquette any heathen can show if they are a guest at another heathen’s house or event and wish to honor Loki as part of said event. 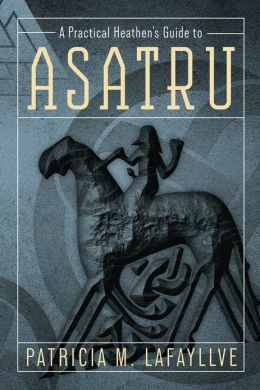 In short, this is a book that any heathen could suggest to a newcomer to Asatru with full confidence that the reader will find in it the things they need, in an accurate context both with regards to history and modern times, and leaves out any fluff, racist or sexist bias, or bizarre ideology. In a market where there are plenty of books on heathenry that do not meet that standard, this is one of only a very small handful that can be unreservedly recommended.